When I ask people what fragrance can be a stand in for Spiritueuse Double Vanille, people often say try Tobacco Vanille. But when I tried Tobacco Vanille, I found these two fragrances too different. In Bottle: Seems Tom Ford fragrances have a tendency to be on the strong side. Tobacco Vanille is a sharp smoky vanilla upon first whiff. The first whiff was all it took for the scent to travel up my nose. I think one of those cardinal rules you learn in middle school science class applies here; waft, don’t whiff. Applied: On the skin Tobacco Vanille behaves a bit better for me. This is all tobacco and vanilla that sort of smoky, warm, creamy scent that’s sort of echoed in Spirituese Double Vanille. Unlike in SDV, Tobacco Vanille has a less woodsy and less boozy smokiness to it. This smokiness is coming from a pipe tobacco scent. And let’s not confuse tobacco used as a fragrance with the often sour smoky smell of a cigarette. This stuff is smooth and clean and smells a bit more like burning leaves with a very nice smooth character. As the fragrance ages, I get a bit more of the other notes in this, particularly the hints of woodsiness here and there and occassionally a good sniff of spices. There isn’t much else I can say about Tobacco Vanille. It’s a smoky vanilla scent, a couple of notches away from SDV though these two could be pretty close cousins. I still like the touch of booziness in SDV and the more woodsy character in that fragrance though. 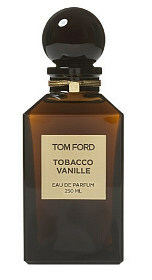 Extra: Tobacco Vanille is a member of Tom Ford’s premium line of fragrances called the Private Blends. I had a devil of a time tracking down an actual bottle and didn’t end up liking it enough to drop over $300 on a bottle. Design: The Private Blends are bottled a bit differently than other Tom Ford scents. I’ve seen various styles and all of them are very pleasing. There’s the style shown above that I see most often but the bottle I sampled out of had a square cap instead of a round one. I believe the style of bottle differs depending on how much juice you’re getting. Notes: Tobacco leaf, spices, tonka bean, vanilla, cacao, wood sap. Lovely as this is, it didn’t sway me from the SDV crowd. I’m still a big fan of Spiritueuse Double Vanille. Though Tobacco Vanille can scratch a very small itch if it came down to the wire. Reviewed in This Post: Tobacco Vanille, 2009, Eau de Parfum. This entry was posted in gourmand, Reviews By House, tom ford and tagged cacao, tobacco, tonka bean, vanilla. Bookmark the permalink.